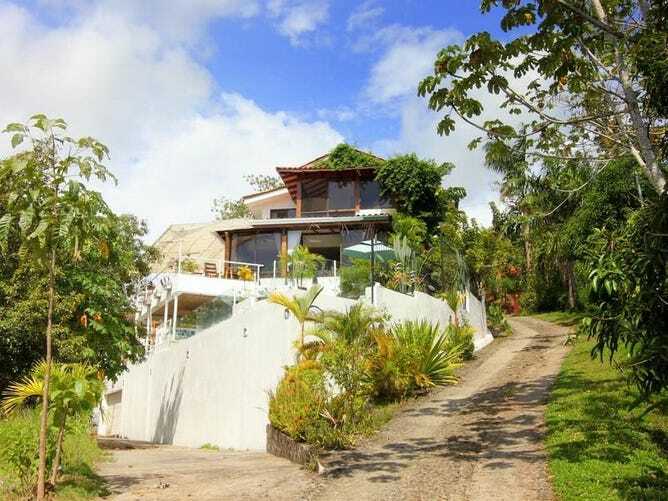 Details:- Conveniently located in a quiet residential area about halfway between the town of Quepos and Manuel Antonio National Park this concrete home boosts mountain, valley and ocean views. With 5 bedroom, 4 bath, in three different levels, it has a beautiful swimming pool complimented with an open BBQ area terrace which is a delight for entertaining. The main floor has an entrance from the conveniently located covered garage with door opener that takes to a nicely furnished living area and kitchen in a tropical ambience from the garden outside. Glass doors take to an outdoor terrace and swimming pool with great views of a forest valley on the sides and ocean and city view up front. The Bedrooms are conveniently located on the second floor, the main bedroom has a full bathroom with Jacuzzi and abundant views of the ocean and green areas around the house. There are two more bedrooms and another shared bathroom on this floor. The lowest level has a double covered garage with door opener as well and a mini full equipped studio in there, ideal for a care taker or manager, plus a visitors master suite with Tiki Style Palm roof thatching in a sub level between this garage and the pool area. Only 10 minutes away from the Quepos Airport, and a few miles from the famous Manuel Antonio National Park with easy access to the best beaches in the Pacific area. Year round sunsets and a short walk to restaurants and most amenities in the scenic small town of Quepos.